Well, this week I managed to cross 2 things off the list! I finally reached 100 followers (I was sitting on 98 for a while there, so that's exciting!! Thanks guys!) aaand Mr Peck bought me a pleated skirt for valentine's and it finally got here, and I love it!! YAY! Feels good to achieve something! Do you think I should have a 100 followers celebration? I also managed to finally get another thing off my to do list... 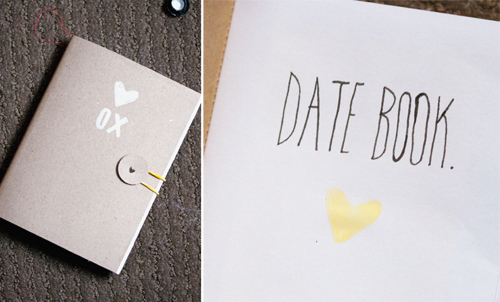 I made a little book where Mr Peck & I can stash our date ideas and write a little something or stick in a picture to remember it by. This year we're hoping to be a little more into the whole dating thing and try and be more spontaneous and adventurous. To help along the process I thought it might be nice to have dates kind of pre-planned so on date night/day we can whip out the book and have an idea there. I think it will help get rid of boring movie/fast food dates. I've made a little tutorial for you guys so you can make it too! 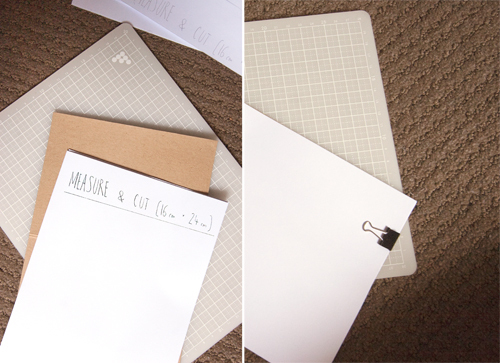 I have written a tutorial for a notebook before but this one has some extra features. 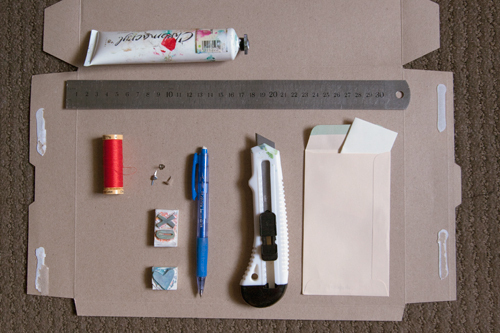 A ruler, craft knife, pencil, card (or a cereal box), small envelopes, split pins, a rubber band, paper for the pages, paper for the date ideas, paint, stamps, glue or sticky tape. 1. Measure and cut 16cm x 24cm in brown card (I use cereal boxes) as well as as many sheets of paper for the inside as you want. I used 12 sheets of office paper to make 24 spreads. Measure to the middle (12cm along the 24cm side) and score down the card only. 2. Clamp all the sheets together, this makes the sewing a bit easier - I've used dog clips here. Don't worry if your pages stick out from the card a bit, you can trim this later. 3. Sew all the sheets together with a sewing machine along the fold line - I do this by hand (eg not with the pedal) so I have more control. I use a normal needle and cotton with a medium sized straight stitch. You could use thicker cotton for a stronger bind, but I've never had any trouble with mine. You might want to coat the stitching with some wood glue once you're done for extra strength. 4. Decorate! 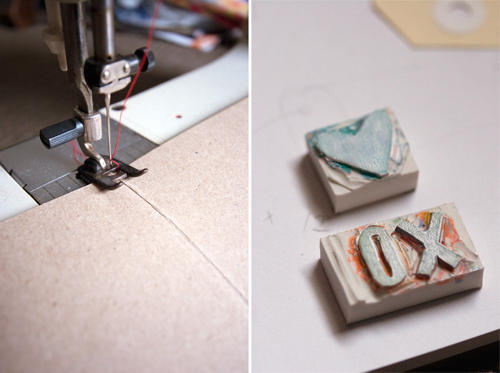 These are some hand carved stamps I made from erasers. Let me know if you want a tutorial on that... It's super easy. I use regular acrylic paint for the stamping because I don't have any ink. 5. For keeping the book closed, I cut 2 circles out of the card at 2.5cm diameter each and put a split pin through the middle of each. I measured 12cm from the top and about 2.5cm in from the edge and used a pin to create a small hole. This made it a lot easier to poke the split pins in. When you split the split pins, make sure you leave a little gap between the circle and the book for the tie or band to fit in. I used a rubber band to close it all up. 6. 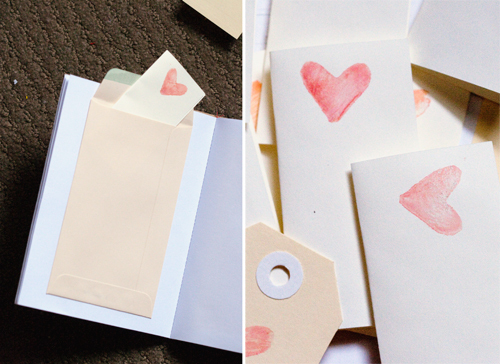 Stick in little envelopes to keep your date ideas in. 7. I used my stamp again to decorate the paper that we write the ideas on. Then you just have to think of a whole bunch of date ideas! I like the idea of pre-buying something thing like tickets or gift vouchers. Anything you can do to make date night fun and ready to go.